A bit of a mixed market this week with the very fine end still surging forward but some beginning whispers of nervousness among exporters at the auctions this week starting to creep in, although this may begin to be eased by a softening A$. The EMI closed flat on the week in A$ terms at 1546¢ and slightly softer in US$ terms at 1184¢, down 4¢. In the West the indicator was off slightly more at around a 20¢ decline in both A$ and US terms – figure 1. 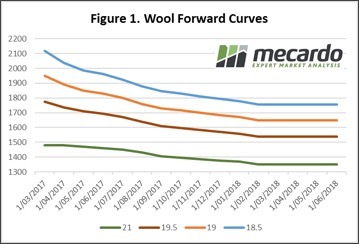 Reports from wool brokers this week suggest that for the first time in a few months’ exporters have begun to question how long the rally can be sustained. 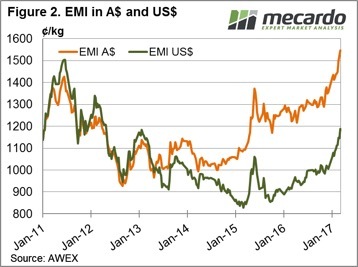 Taking a look at where the EMI is trading in A$ terms, when compared to US$ terms, relative prices being paid for Aussie wool by offshore buyers is still lower than the 2012 and 2011 peaks, suggesting that there may be some life left yet in the current rally – figure 2. The market potentially taking comfort next week in a further softening of the A$ overnight toward 76.3US¢, particularly if the currency can continue to drift off over the weekend. 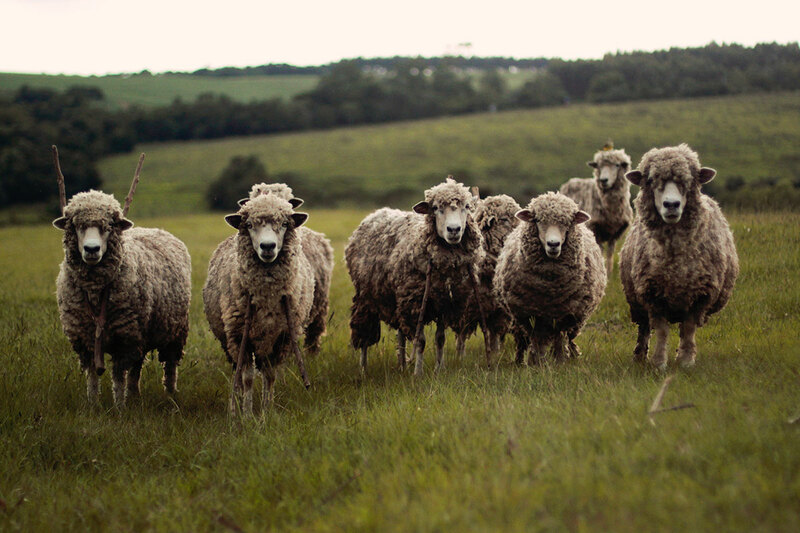 Most major Aussie banks still forecasting an A$ toward 70¢US by the year end which will provide medium term support to the wool market should they prove to be correct. Next week we have just under 47,000 bales listed for sale with trading schedule two days. A drop in volumes on offer for week 40 and 41 toward the lower 40,000 region could see further gains in price in the coming week, particularly if the A$ can slide back towards 75¢US.